Office Space - Grand Island, Nebraska. 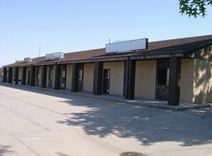 Rented office space can be booked close to this busy Medical Centre and to many nearby retail stores and restaurants. This facility is conveniently situated next to a large shopping mall and offers well designed offices and meeting rooms. The space can be leased for various rental periods and the rent will reflect this accordingly. There is also ample parking in this one story facility.